Have you ever delivered a project where your team prematurely celebrated a job well done, only to have the end users not jump on board with the same enthusiasm? When users are not on board, reaching the organization’s goal for the project is a challenge. So it’s important to remember that we complete projects for our customers and end users, not for ourselves. 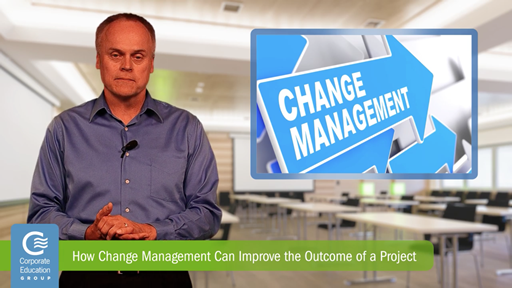 Using change management, also known as organizational readiness, will enable project teams to implement change more effectively. Identify a project champion with enough authority and influence that others will listen and follow. Your champion must have a sense of urgency, as well as commitment, and ownership of the project to remove obstacles, resolve issues and lead others through the change. Define the goals of the project. What will the outcome look like and who will be affected using quantifiable SMART objectives which are Specific, Measurable, Attainable, Realistic, and Time-Related. Identify and engage stakeholders to build a consensus on why the project is necessary. Utilize supportive behaviors to deal with any resistance from the group. Drive it down to the individual and any "what’s in it for me" attitudes, then tie it back to the goals and objectives. Communicate openly and with transparency. Track and share the status as the project progresses. Communicate the planned versus actual scope, time, costs of the project, and how the variances are being handled. Implement the solution in a highly visible way. As the end gets closer, emotions such as uneasiness, anxiety and fear will inevitably start to rise. Provide shorter bits of communication more often, just in time training, and start support lines. Implement iteratively, doing small chunks or pilots, and share the results of each implementation. Encourage end users to internalize the change. Alter the performance criteria on how users are evaluated based on the project’s results. Provide rewards and recognitions for doing it right, and penalties for “back sliding” or doing it the old way. Projects are changes — changes to processes, infrastructures, software systems, roles and responsibilities, or anything else. The better job we do in engaging the end users, the more effective the implementation will be. That is what change management is all about.